Brian Rood, M.D., employed quantitative proteomics to tumor samples that led to novel therapeutic targets for Medulloblastoma and other tumors. 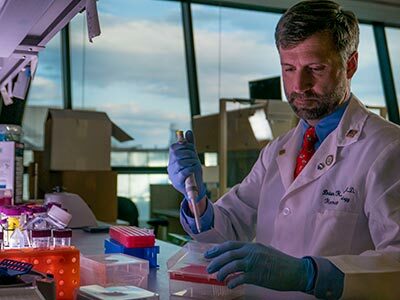 In a recently published study, Brian Rood, M.D., a neuro-oncologist at Children’s National Health System, employed quantitative proteomics to tumor samples, a technique that could lead to novel therapeutic targets for medulloblastoma and other tumors in the future. Currently, many experts use genomic characterization to understand the genetic makeup of cancer cells, which has deepened the field’s collective knowledge of tumor biology. However, it has remained challenging to infer specific information about how the tumors will respond and consequently develop more effective therapies. Medulloblastoma is the most common pediatric, malignant brain tumor. Through Dr. Rood’s research using proteomic analysis, he was able to identify and measure the protein makeup of medulloblastoma, which led to a potential pathway for clinical intervention to treat this life-threatening cancer. The findings were published online June 7, 2018, in Acta Neuropathologica Communications. Dr. Rood compared proteomic and genomic data to confirm that genetics do not accurately predict the quantity of proteins. By directly quantitating the proteins and comparing them between different subgroups of the disease, they were able to identify protein-based pathways driving tumor biology. With this information, Dr. Rood was able to demonstrate that medulloblastoma depends on a crucial pathway, the eukaryotic initiation factor 4F protein synthesis pathway, resulting in the identification of a potential target for new treatments in medulloblastoma. Ultimately, Dr. Rood found that proteomic analysis complements genomic characterization and the two can be used together to create a more complete understanding of tumor biology. 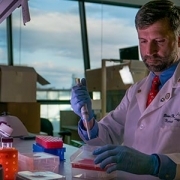 Going forward, he hopes proteomic analysis will become common practice for studying all tumors, allowing tumors to be categorized and grouped together by protein makeup to help the field identify more effective therapies for all tumors.